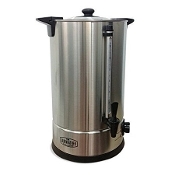 The Sparge Water Heater is a temperature controlled urn that allows you to heat up to 4.8 US Gal of water. This makes the process easier, start heating your sparge water when you begin the mash to ensure it is ready for when you need to sparge. Once water is at the required temperature, it will hold that temperature until changed or turned off. An excellent addition to any Grainfather! Can be hooked up to the Grain father pump system for easy sparging ! NOTE: Graduations on the scale are measured from the tap. Pour from the tap until flow stops. Do not tip the vessel.